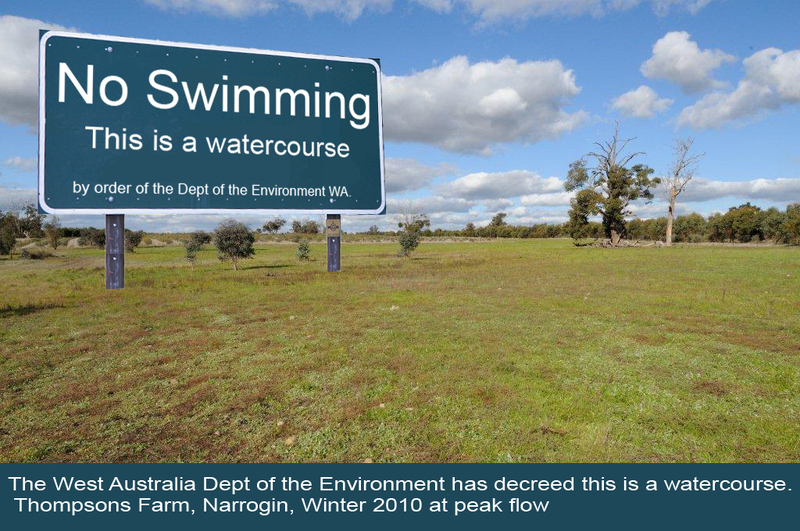 When Matt and Janet first came to Western Australia they were told they could run a feedlot without regular licenses as long as they were not within 100m of a watercourse. It makes a big difference. If a farm is a category 68, it can run thousands of cattle (and many dairy farms do) without being licensed. This is the ongoing saga of how Big-Government can use complexity to play Kingmaker. I didn’t think I’d ever find agricultural codes interesting, but by paying attention to the detail we can see just how powerful The Department of Environment (DEC) is, and how selective it can be. You would think it would be easy to measure off 100 m toward a waterway, but how do you define a waterway? You can I might expect that it would have banks, or that in a 100 year flood the water flowing in the gully might have a chance of reaching a body of water big enough to have a fish. Don’t apply for a job at DEC WA. DEC has declared that Narrogin Beef Producers are a Category 1 property needing licenses because there are watercourses to the North of the feedlot, and to the South West. This picture below, is a photo (slightly amended) of that paddock to the north in winter. Would you call this a watercourse? A photo of the Northern “watercourse” of The Thompsons property. (Sign added). This is the “watercourse” to the South West, a remnant waterway. This entry was posted in Civil Rights, False Allegations, Propaganda Exposed, Social-Destruction Enterprise, The New World Order. Bookmark the permalink. This is a very interesting article and the story is important to the ideas of Fatherhood.